AFTER POWER-WASHING this old house, I developed a new appreciation for its front porch. I’m talking major ornamentation here. It’s got columns. And capitals. And corbels. And that’s just the Cs! There are brackets and arches, too. Would you like an intimate look at these Victorian details? Good. Because this morning I photographed all of them for you. Disclaimer #2. I did not personally power-wash the house. I rented the machine, along with someone half my age to use it. I pointed, and he washed. Disclaimer #3. This photo gallery will probably bore the hell out of you. 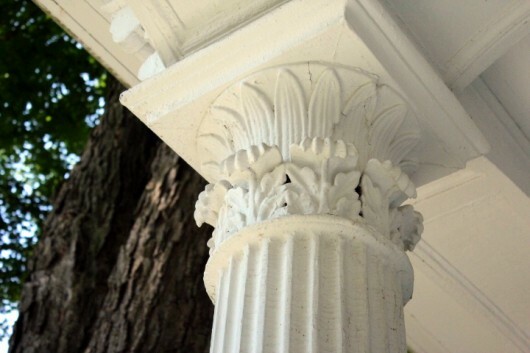 On the front porch are six fluted columns, each adorned with a Corinthian capital. Detail of a capital. Please note the acanthus leaves. At least, I think they are acanthus leaves. 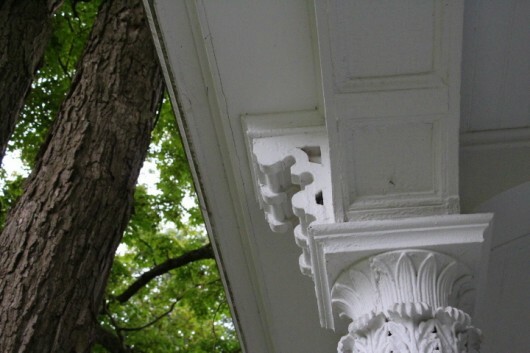 A Victorian bracket is located just above each column. True confession: I’ve lived in this house for 11 years, but only today did I notice these brackets. 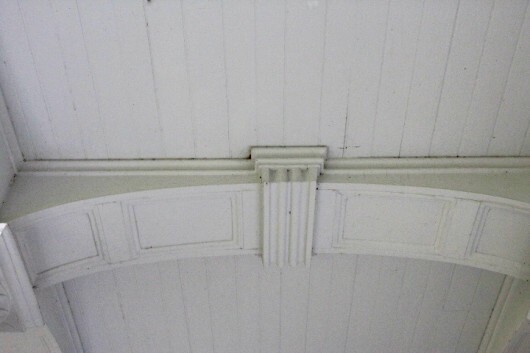 And here is the porch ceiling. It’s embellished with six arches. 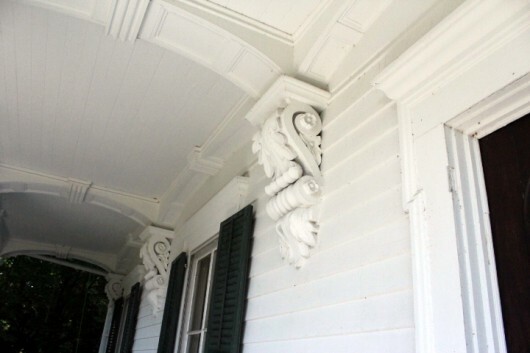 The house-side of each arch is marked by an elaborate corbel. Close up of a corbel. Who’s responsible for these highfalutin details? That would Mr. Charles Wild. Around 1866, Charles inherited the handsome Federal house that his father, Nathan, built in 1826. Obviously Charles had loads of cash and a taste for the opulent, for he gave the old place a grand, Victorian makeover, both inside and out. He also added a very formal wing to the house, which I now use as a Music Room. 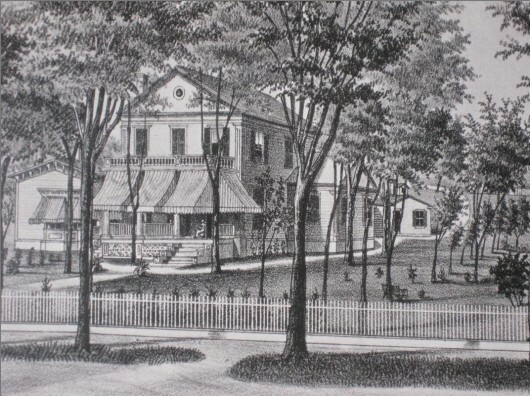 When I get the chance, I’ll scan a sketch of this house from 1840 (pre-Victorianization). Meanwhile, here’s a drawing from 1878. The shuttered windows and canvas awnings indicate the sketch was drawn during summertime. Nowadays, trees in the front yard tower over the house, and produce abundant shade. The house stayed in the Wild family from 1826 until 1975. That means my partner and I are only the fifth owners of the joint. According to Janice Wild, Nathan’s great-great granddaughter, Charles and his descendants — right up until 1975 — employed a large, full-time household staff. And no wonder! There were columns, capitals, brackets, and corbels to clean! I like to think the staff looked just like the one pictured above. A more capable crew never existed. Of course, a grand front porch needs an equally-grand entrance for the house. The mahogany double doors from Charles’ time are still here, along with their bronze hardware. On my to-do list is the complete restoration of these doors. 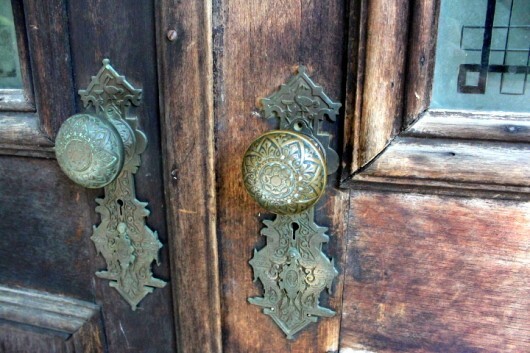 As for the bronze doorknobs and escutcheons, my savvy friend Michael recommends burnishing these with fine-grade steel wool. This way I can remove much of the tarnish without removing the century-old patina. I’ll gladly walk you through these restoration jobs when I tackle them this fall. Anyway, I hope you enjoyed our brief time on the porch. I should have served you lemonade during your visit. Lemonade with, perhaps, a little vodka (for medicinal purposes) mixed in. And here’s another thought. 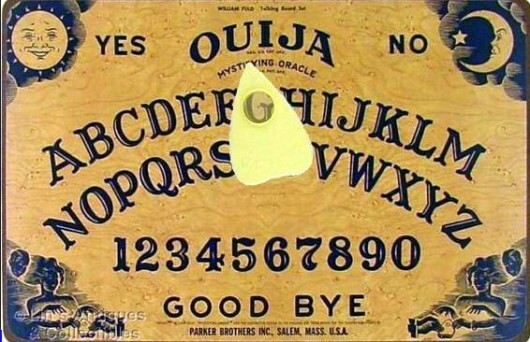 I’d like to consult with Charles Wild via Ouija board. I’d like to ask him if he intended his architectural elements to be painted a different color than that of the clapboard siding. From my own research, and that of a local historian, the house and its accoutrements have always been painted white. And the shutters have always been painted green. Except for the very brief blue period in the early 1980s. The blue color was almost immediately returned to white. Are you fascinated with old houses, too? Talk to me in the comments field below. As always, an angel gets his or her wings whenever someone posts a comment or clicks the “like” button here. Meanwhile, don’t miss anything at A Garden for the House…sign up for Kevin’s weekly email updates. How’d Your Winter-Sown Seeds Do? I love your up-close photos of the beautiful features of your porch and LOVE the doors. My personal opinion is that the features should e white. I live in an old sandstone cottage built in the 1860’s. Mine is not so well preserved! I loved the tour–thank you, Kevin! My friend and I want to make a road trip to visit your beautiful home and gardens….someday! This was so much fun. It means so much more to have been there to see the beauty of it all and I love the history of the house. The sketch is marvelous. Oh, and thanks for the lemonade. My goodness! Your house is absolutely stunning! I live in a newish build and, although its pretty, it lacks the character and detailing that your house has tons of! I love it and I love all the pictures. They were not boring AT ALL!! Gorgeous. And wouldn’t you love to have that staff to keep it all neat and tidy for you? We’re doing a big update on our place so your pics of the architectural details is well appreciated. I love corbels! Thanks for the tour! Thank you for yet another interesting look at your house. I love the detail you include and your humility. Obviously, you do not take yourself TOO seriously. Love the meticulous details. My first house was Edwardian 1914 and then the house I shared with my partner was 1892 Romanesque Victorian brick townhouse in the city. Narrow and tall. Some of the “historical” touches were added by him around 2000. They fooled even knowledgable real estate agents. Now, our house is a French chateau inspired eclectic house, built in 2008. Quite a change. Would love to visit. Do you allow sleepovers? LOL kidding, sort of. As I type this, the oven timer is ringing. 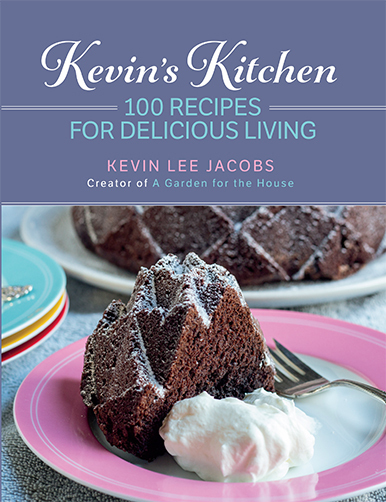 Kevin Jacobs’s Classic Tomato Pie is ready to come out and sit awhile before serving. Can’t wait to taste it. You called everything by the right name! My mantra is I wont live in a house unless you can put a ball on the floor in the front room and it immediately rolls somewhere else! I live in an 1800 Enlglush stucco complete with cobblestone paths, window seats, flower boxes and ivy. We have painstakinly restored it too. When we cleared the trash and years of pune needles, our grandson remarked,”look NeeNed a graveyard! There was an old rock garden complete with angel statuary, one with a broken head we cant fix so she stands proud holding her own head in my restored garden of herbs. Your home is stunning. Thank you for the tour. I believe the all white makes it regal! Wonderful tour Kevin. Thank you! Long ago I assisted in the renovation of a beautiful old house from the 1800’s. My instructor owned the house and students from the community college construction technology program helped in the restoration. I fondly remember driving out in the countryside with Dr. Byrd to an old, but once grand home. We were searching for replacements for the original hardware which held the working shutters on his house. Later I had painting classes there and learned to paint muntins and mullions with a 3″ brush (no tape allowed!). That home had belonged to a poet. It was, and is beautiful like yours, though it isn’t being cared for like Dr. Byrd did..
Love, love, love your house. So much want to come and see it in person soon. Thank you as always for sharing with us all. First of all I love Ann Manning’s comment…mop your brow..hilarious. Thanks for the pictures, as always your commentary is entertaining. I don’t have TV so this was my Downton Abbey. The colors are perfect, but if you were to take the liberty of painting the corbels, geegaws and doodads a slightly darker beige/white so they would stand out I don’t think it would be heresy. It might even be a darn good idea! I have lived in old, new and in between houses. City houses and country houses. My current house was built in the 90’s with 2 x 6 walls, oak and mahogany trim, Amish cabinets and arched windows, with an old fashioned vibe. It is in a town but on the edge, on one acre. It is the best of both worlds for me as my husband said we were too old to buy a two story old house and he’s probably right. But I love to look at others and I enjoyed the visit, thanks so much! Your house will still be standing when those built today are gone. Ah Kevin, how funny you are! I loved your pic of “the staff”. Wouldn’t you just love to have Carson and Mrs Hughes run your home for you? So would I. I love your porch with all it’s architectural details, but I must admit, for me, it is missing a much longed for addition – a porch swing! The perfect place to sip a cool lemonade in the evenings before Carson informs you that “Dinner is served”. That’s really weird. I was just wondering why I hadn’t seen any posts about your porch. I’ve got porches on the mind since I’m about to have mine restored. Your porch is really fancy. Ever thought about painting the ceiling a pale blue? Might be really pretty with all that white. I am obsessed with old houses, have been since a child. I live in an 1875ish vernacular Gothic Revival workingman’s cottage. I removed the asbestos shingles and restored the original clapboards that were underneath. Corinthian, acanthus, also known as Bear’s Breach…..grew up with the plant, noticed it in the Garden of Gethsame…..column topping of choice at the Filoli Mansion south of San Francisco that was used for TVs Dynasty and Beatty’s ‘Heaven Can Wait’…great share. Mary Frances – Oh, to have Carson and Mrs Hughes manage the day-to-day around here. I’d treat them like gold. We just last year bought an old house (at least was old until reading your post, as it was built in 1929). I love finding out all the history that the house has lived through, but being an architect also may help fuel my interest. I enjoyed your jaunt down your house’s memory lane. You know, Victorian styled homes were never my cup of tea. Lately however, I’be been seeing them differently. I like all the photos you took, its really amazing all the work that went into just the porch- the leaves sculpted and curled and characteristically cracked is completely beautiful- that’s a real outdoor sitting room when even the ceiling of the porch will keep your eyes entertained for hours. I can tell you aren’t sure about the green. Honestly, neither am I. It takes a while sometimes to let go of what your home used to be- and to let it become yours. Completely yours. I finally changed a few things in my house because something just wasn’t right- I made them ooze Jessica- and I’m so glad I did. I’m curious what the wood is underneath the green paint. Maybe it matches you beautiful front door? Stain it. That would stay true to the house & be very stunning. Kevin Lee, we watched TV just like you did. You know we all know that the picture of the “staff” you have used was not from your beautiful home records. But, if I needed a staff for my home, this would be the one I would hope to have. Brenda T.
Thank you for sharing those photos! All of the details are stunning! The workmanship from so long ago is craftsmanship at its best and today could probably only be recreated minimally. I do hope that you are able to spend some time on your porch and relax and rest amidst its beauty. Have a great day ! Fabulous. The ceiling should definitely be a pale shade of sky blue. The Victorians would demand it. Nothing boring about old houses and their history! Even though you never really “saw” the brackets for the first 11 years you lived there, they subconsciously lent an air of refinement to your stroll up to the front door. We are all edified by your investment of time and research. Never bored! I love the little insights into your life and your home. Thank you for sharing it with us. It gives me ideas and inspiration for my little bitty 50’s ranch in the middle of Nebraska. Beautiful porch – the floor of the porch wasn’t mentioned. Is it wood or stone? I have a porch that has a wood floor which needs to be refinished. So I was wondering what work needs to be done to your porch floor. I love your blog – immensely! Hi Susan – The porch flooring is wood. It’s painted a pale gray-green (Benjamin Moore’s “Rushing River”). Love your tours of your fabulous old house and superb gardens!!!!!!! Wish I lived in a house like that, but at my age would have to have help with all the housekeeping. Thanks for all the good recipes too!!!!!! Completely NOT boring! The craftsmanship is stunning – something simply not available today. Can you imagine the skill needed to create those details with the tools of the day? Love the panel and bracket-ed arches. thank you so much for sharing. Please do not paint the pretties-I live in an historical “Victorian Village” and always think the ladies with her pretties painted look like whores on the street corner. Garish and cheap. a true Victorian lady is tidy and discreet in her beauty, allowing only those intimate with her to view her details, and truly appreciate all her hidden treasures. I love these beautiful old houses. The new McMansions are so boring. What a beautiful home you have! I was certainly not bored looking at the photos. I am glad you have an original drawing of your house. The design of the column capitals are based on the design for the “Tower of the Winds” in Athens, featured in Stuart and Revett’s “The Antiquity of Athens” of 1762. The upper leaves are apparently palm leaves. 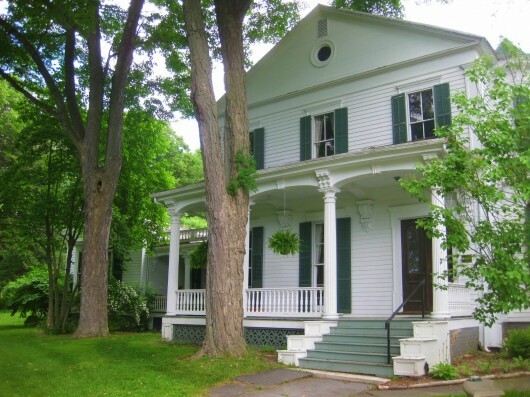 The original house is really Greek Revival. The pediment on the front gives it away. What makes you think it is federal, I think, is the fact that the window muntins and window trim are more delicate than usual for the style. 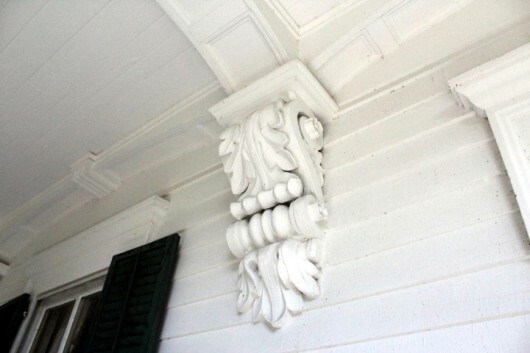 As a Greek Revival house, it would have almost certainly been white originally. The dark green shutters and the green color of the flooring are perfect. Another option for the flooring would be a gray paint or stain to mimic the fact that many porch floors and steps were left to weather a silvery gray (easier done in the olden days when the old wood lasted far longer than the wood we have today). The house may have been painted in a more colorful scheme at some point when Charles owned it, but my experience is that most of the time the owners of what were at the time grand old family homes were quite conservative and preferred the original historic look. I love your website and get your posts whenever you send them out. I have three earthly passions: Victorian houses (ours is a Second Empire Italianate built in 1880), gardening, and cooking. Can you guess why I love everything you write about? Our house is painted with 7 colors to better bring out the details. (The house was built by the owner of the local saw mill, so you can imagine the overload of woodwork on it, both in and out.) The colors are not bright hot, as I often see them in San Francisco or the southwest, but soft and creamy–grey for the body, light creamy beige for the trim, white, 3 shades of blue, and green. Flower arranging is a particular delight for me, as I have multiple gardens, most of them perennial. I love your recipes and copy them frequently. Just two nights ago I tried the smoked trout on toast for an hors d’oeuvre, and they were snatched up in no time flat. Nothing is boring about your photos or hobbies to me. I always look forward to the next installment. Grew up in a 1975 gingerbread Victorian…white with black shutters…porch floor wood, stained natural to match door. Alas it is long gone…taken for part of the Massachusetts. Turnpike. Thank you, Kevin, you take me down memory lane 🙂 Love Santa Barbara, but do miss the flora of the Northeast. I love older homes with character. Thank you for allowing me to vicariously live in an older home through your descriptions and photos! At one time I lived in a beautiful old home that was built by a Doctor in 1894. There is a date brick in the foundation of the home. I wish I had taken photos of some of it’s most interesting details when we lived there. No telling what has been done to it in the meantime. The most beautiful thing was the two story foyer with it’s hand carved spiral staircase that was brought over from England when the house was built. Thank heavens no one had ever painted it, but all the beautiful ornate woodwork, door facings and such had a multitude of layers of white paint built up over the decades. Some one had bricked up an old fireplace and then plastered over it. Behind the fireplace was what we thought was the household help’s stairway up, with a small bedroom and closet. There were two other large bedrooms that were probably for the children and in more recent years, bathrooms were added on the back of the house, on top of each other, for the downstairs and the upstairs. In the kitchen there was a “pantry” with the floor to ceiling cabinets, a huge flour bin, that pulled out, the doors to the cabinets were open with window screen coverings to keep out the flies. A large pastry board that pulled out of a slot to roll dough out on, and a small shelf front all the way around the cabinet. The old kitchen sink was still there too, fastened to the wall with a small supporting cabinet underneath, it had the faucets and handles that came out of the wall. Off the kitchen was a room that we used for laundry but the winter we moved in the house, it was so cold, (snowed 8 inches) we couldn’t move our refrigerator yet so we kept all our food in that room. It was so cold in there that a bowl of ice cubes didn’t melt!!. Absolutely love your gracious house and it’s details! Thank you for sharing such a jewel and your care and thoughtfulness in restoring it to it’s splendour is praiseworthy! The flower arrangement is exquisite. I planted asters (with zinnias, my mother’s favorite flowers), dianthus and marigolds yesterday and while I was doing it, I thought of bouquets I can create with them later! Of course in the tropics where I live we have other spectacular blooms, than what the northern hemisphere’s gardens produce! I have hibiscus, bird of paradise, flowering gingers, heleconias, gardenias ………….. but because I come from Europe, I also cultivate roses and other favorites like gladiolis and I love the irises and zinnias! At the moment I have a bird of paradise that has 3 flowers each 1 foot across in white and burgundy! Thanks again for sharing, it is much appreciated! Hi, Kevin…loved the A, B c’s of the porch….keep on trekking….can it get more interesting? I do love old houses. I love knowing about their history, their remodeling and restoration. 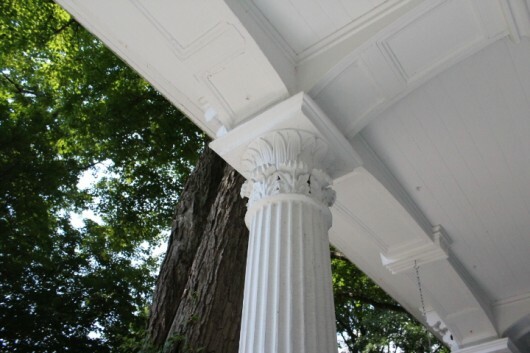 I could never be bored looking at features like the details of your porch. I am fascinated by the evolutions of houses in general but moreso by those with a long history, The one house that my family lived in when I was a child and my most favorite of all the places we lived was a modest Victorian-style with a living room AND a parlor, wonderful original oak woodwork, a front and back porch, but also a small side porch only large enough for one person to stand on but with a little roof with brackets on either side. Very charming. In addition, there were pocket doors between the living room and the dining room and the living room and the parlor, plus old brass doorknobs on all the doors. We purchased it from an elderly lady who had iived there for many years and when she left she left behind an attic full of treasures which we children loved to look at and explore. I remember finding the stack of old 78 rpm records which we played on our phonograph. One I remember was the music to the song “La Paloma” and one was a sort of narrative called “Uncle Josh at the Dentist”! Wish I had those records now. Don’t know what ever became of them. Anyway, it was a wonderful old house and my heart breaks every time I see how it has been ruined by renovations inside and out (an apartment upstairs, front and side porches gone) and allowed to become run down and neglected. But, I do feel fortunate to have experienced living in it. And thanks so much for sharing the details of your wonderful old house, Kevin. Can’t wait for the next installment! I LOVE your front porch (and your home itself)! I usually am not drawn to the extremely ornate Victorian details. Most of the time I find them very gaudy and overdone. But the ones on your porch are surprisingly modest compared to most and give it an understated grand feeling. I definitely believe it’s the white paint helping with that. We have a lot of old Victorians near where I am, and many people have restored them to the multicolored states of past. While I appreciate the effort and attention to detail, I’ll take your understated beauty over all of them. Oh, how do you keep bugs at bay with all those little crevices? Hi Sharon – Most summers, I give the details on the porch ceiling a weekly blast with the garden hose. But this summer I slacked off, and ended up having to rent a power-washer (and someone to use it). In any event, a firm spray of water keeps the porch looking its handsome best. 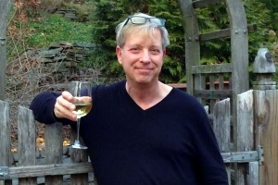 Thanks, Kevin, for sharing the history of your home. Fascinating! I was wondering …. what was the wiring like in your home when you first acquired it? Did you have to disconnect or remove knob & tube and/or re-wire? Just curious. Guess you can tell that I’ve been watching a lot of HGTV renovation shows. There is nothing boring about this porch tour. The beauty is in the details. 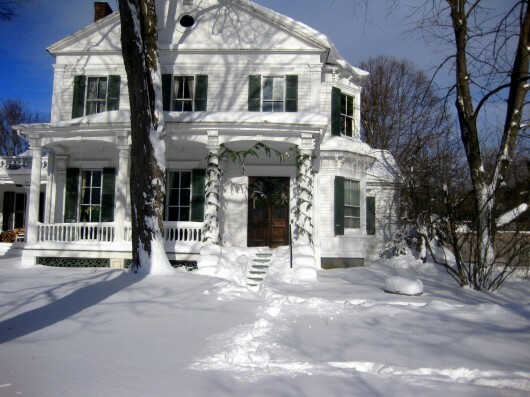 We stayed in a Victorian B&B in in Whitfield, New Hampshire last year and loved it. Kevin, I had the pleasure of being a Military Housing Manager at Fort McPherson, GA, before I retired. We had 20+ houses on the National Register of Historic Homes. The homes on Generals Row remind me a lot of your house. They were kept in excellent condition, and while I was there, we restored a lot of the beautiful fireplaces and mantles, doors, and other significant features to their original condition. One trick that one of the General’s Aides used to polish the ornate brass door knobs throughout the house, was to soak them in Kool Aid, a little thicker than what you would drink. He let them soak overnight then cleaned and polished them the next day. I was amazed at the results. You may want to give it a try when you restore your entry doors and hardware. You have done a wonderful job with your house. Kevin, I love your front porch!!! They don’t make them like this anymore and I doubt if you even have one built like it. It fits the rest of your house beautifuly, I wouldn’t change a thing. We live in a house built in the 30’s. Not as beautiful as yours. I like the new but I would take a house like yours before a new one. The old has charater (personality). Its too early to check to see the right spelling for charater. So glad I signed up for your weekly. Thank You. Thank you for sharing your beautiful home with us. I enjoy each tour and the details that you share with us. Kevin, your porch, like the rest of your home, is lovely but you need to add some furniture so you can sit down and enjoy it! You’re missing out on a wonderful opportunity – nothing quite like sitting on a porch and enjoying a cup of coffee or listening to the insects at night! Next time you need to paint the ceiling, look into the color “haint blue” which is popular in the south. I live in an old Bucks County, PA stone farmhouse that is also full of charm and character but was missing a proper porch until about ten years ago. Absolutely love and appreciate the porch every day! Thanks for sharing your home and cooking/garden knowledge! How fun it would be to see your house and garden. Do you ever offer tours? Even just seeing the outside of the house and garden would be a treat. You’ve done a wonderful job refurbishing. It’s wonderful you are still making house discoveries, Kevin. What a treat to have an up-close and personal tour of the front porch. I loved every feature but was especially taken with the arches. It’s all so beautiful though. What a treat it must be to have it all cleaned, painted and a fresh new look at it all! What would really look good is if there were a way to use semi gloss or something similar on the exterior and high gloss on the shutters. Thank you for sharing! Always a treat to read your witty posts. Was just browsing the web yesterday for corbels when I redo a ’70s fireplace. I’m more inspired! Would rather read about corbels than Kardasians. There you have it! Thank you for the different view of the porch. I love your house and all of the hard work you do to make it so beautiful. Your web site is one of the very best. Your page on making our bed made me do just that. In my old age 75 I have been letting things go. I feed off of your energy. Thank you for sharing. I would like to get back to your area and see your beautiful gardens up close. My Family of Hudson’s were originally from the New York area, but this one has only left California a couple of times. Again, Thank you for sharing the home and gardens that you have made so beautiful. There is almost nothing more, besides tea that is, that I enjoy than looking at, talking about and wanting than an old house! I have a newer home and am always trying to turn it into a craftsman. I love the Victorian features as well. We once owned a 1911 craftsman and I have never stopped wanting that again! I wait each week for your new posts. Thank you for the lovely front porch tour. I am making the blueberry danishes right now! The new carpet for those grand stairs will look amazing. That staircase at Christmas must be pure magnificence.